Tono Furusato Village (遠野ふるさと村) is an open-air museum of traditional houses located in Iwate. You can experience Japanese village life of the old time Japan. There are 7 traditional houses of Tohoku region style and all of them are removed here. You can see the real life of Tohoku region's Samurai era. The main feature of traditional houses in Tohoku is L-shape style. Because it is so cold in winter, the stables are located inside of their house. Admission: 540 yen for Adults, 320 yen for students. Time: 9:00 to 17:00 (last entry 16:00), 16:00 from Nov. to Feb.
1. use JR Kamaishi Line to Tono Station. 2. use a local bus to Tono Furusatomura. 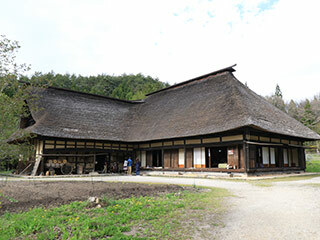 Tono Furusato mura is the restored village that gathers traditional houses that are removed from Tono City. You can experience the life of the old time Japanese village here. There are also local craft works that you can try. In the some of the houses, the real horses live there. Constructed in late 19th century. Constructed in late Edo period. Constructed in 1812. There is a secret room in this house. Constructed in late 19th century. You can experience the painting by glass and flowers.